Russia's northern capital tries to make a name for itself in the culinary world. Visitors to the St. Petersburg International Economic Forum June 18-20 will have the opportunity to try Pushkin shchi, a special type of cabbage soup named in honor of Russia's greatest poet and resident of St. Petersburg. The soup, crafted for the event, is part of an effort by the St. Petersburg city government to promote local cuisine. While Russia's northern capital is renowned for its palaces, parks, museums and theaters, few visitors make any comments on popular travel websites about the city's food. Now the city government is taking steps to change this. More than a year ago, the city's Committee on External Relations began discussing the promotion of St. Petersburg cuisine as a way of marketing the city to tourists, and now the project is coming to fruition. 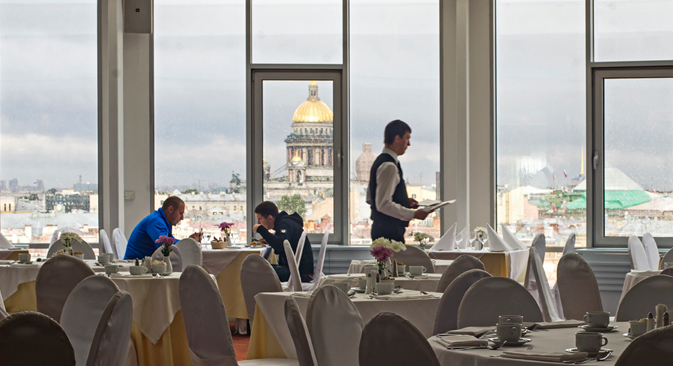 Dmitri Melnikov, the general director of the Solo Sokos Hotel Vasilyevsky, said that St. Petersburg cuisine should be something simple, not the kind of intricate, molecular cuisine that has been trendy in recent years. "There are many places that offer simple and comprehensible dishes, those familiar to Russians since childhood," said Melnikov. "People are now interested in national cuisine, which currently combines old recipes and Soviet classics. In our hotel we have foreign and domestic guests, which is why in our menu we've created a Russian section: borsch, pelmeni, Kiev cutlet, beef stroganoff, vinaigrette and the Stolichny salad [ed – Olivier salad with chicken]. Melnikov named smelt as a particular speciality of St. Petersbug. The small fish is caught in the spring from the waters of the Gulf of Finland, and every May a smelt festival is held on the city's Vasilyevsky Island. Lev Lurye, an historian and ethnographer says that there is no such thing as old Russian cuisine, and what is considered old now is actually the cuisine of imperial Russia. The kind of food that existed before Peter the Great — such as tyurya, a soup with turnips and rutabaga dish, and giant pieces of boiled meat — have fallen into oblivion. "St. Petersburg cuisine, which is rather young, like the city itself, which was founded in 1703, is a unique blend of Finnish and German cuisines and local products," said Lurye. "The residents of St. Petersburg adapted French recipes only in the 19th century. And if we were to look for the differences between Petersburg and Moscow cuisines, we could say that they are rather clear: in Petersburg, people drink coffee instead of tea, eat sandwiches instead of pies and obviously the Baltic smelt, the cloudberry, the cowberry and the cranberry." Restaurant critic Dmitry Grozny compares St. Petersburg cuisine of the 1800s to Moscow cuisine in the 2000s. "As in the 2000s when an enormous number of Italian chefs flooded oil-rich Russia, 200 years ago French chefs flocked to the beautiful capital of a huge empire to make some money," Grozny said. "What were the names of the fashionable restaurateurs of the time? Dominique, Dusseau, Borel, Donon, Legrand." Grozny believes that there is nothing wrong about borrowing foreign experience, but he stresses that a real gastronomic brand can be created only with the use of local products. "The dorado and the sea bass won't help us," Grozny said. "But we have the smelt, a fish that has its own cult, its own mythology. The problem is that the smelt is a seasonal fish and the season does not last long. Its cucumber smell, the true sign of a freshly caught smelt, can be detected in Petersburg only in April-May." PMI Bar features local products in a special tasting menu of local dishes the northwest Russia: smelt, White Sea mussels, kelp and sorrel. As the Pushkin shchi indicates, the drive to develop a unique St. Petersburg cuisine has also involved recreating the favorite recipes of the city's famous residents. Lady-in-waiting Alexandra Smirnova-Rosset wrote about a dinner at Pushkin's house in her memoirs: "I loved supping at Pushkin's. Supper consisted of shchi or green soup with boiled eggs… large chopped cutlets with spinach or sorrel and for dessert there was jam with white gooseberries." The Pushkin shchi recipe was developed from memoirs like this and others. The Petersburg forum will not be the only place where it will be possible to taste the famous shchi. The restaurants at the Ambassdor and the Akyan Hotels have already put the soup on their permanent menus along with the blini of Arina Rodionova, Pushkin's nanny, which have been immortalized in Russian literature. These blini are known for their delicate rosy color, which is obtained by adding beet juice.